Traveling Europe is a bucket list dream for many. College students save and strive for a European backpacking trip, art students flock to Florence, hikers to Switzerland, and wine-lovers to France. In my college days, the love of Italian food and culture lured me over with a study abroad. More than a decade later I still have lovely memories of zipping around Europe on the trains and rock-bottom budget airlines. There’s no need for me to sell the appeal of living in Europe, it’s a gorgeous region of the world, and one that has — surprisingly — a number of areas with an affordable cost of living. While Spain and Portugal stand out as the most affordable in Western Europe, Berlin and Amsterdam have both emerged as expat hotspots. 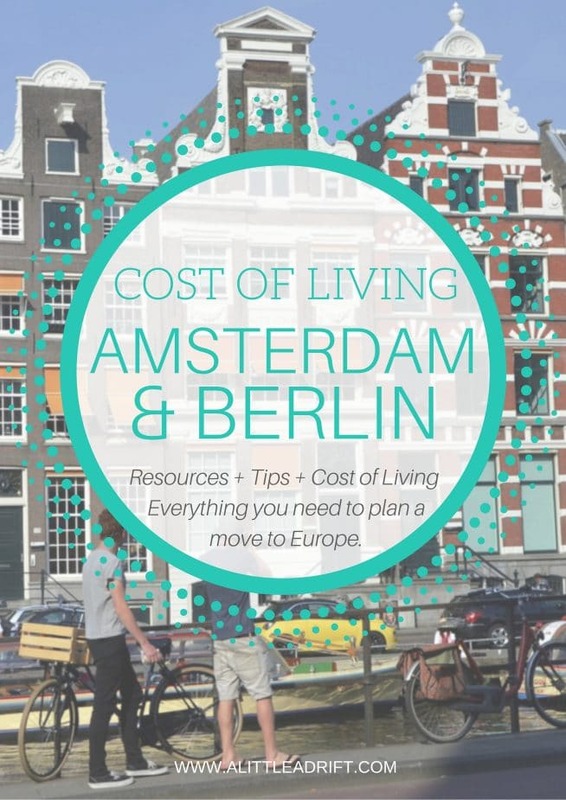 The ALA Cost of Living guides most often take an in-depth look at a single city or country. And while Berlin and Amsterdam are in two separate countries, they’re two cities expat often consider simultaneously when looking at this region of Western Europe. Perhaps the toughest part of choosing where in Europe to live is also considering which countries offer expat visas and a fairly painless entry process for new arrivals. If you have the privilege of moving and retiring abroad, both Berlin and Amsterdam have a lot to offer in terms of quality of life, culture, and accessibility. The cost of living is significantly higher than in places like Thailand, Mexico. And it’s a notch up from the cost of living in hotspots in Eastern Europe, but what you get in return is worth the added costs for expats and digital nomads interested in basing from Europe. It all comes down to quality of life and culture if you’re considering moving to Western Europe. While I far prefer the climes in Spain and Portugal, if you can handle cold winters than Germany or the Netherlands are appealing options. Even more, however, is living in the EU makes traveling Europe super easy. So, even if you choose to live in Berlin, you could spend a month in the south of Spain, or jump on an affordable flight to Africa. For travel lovers, using Europe as a base often makes financial sense. Though Western Europe costs much more than living in Southeast Asia, flights around the region cost a lot less. And with Norwegian Air and low-cost carriers flying NYC to London, North Americans can now fly home affordably too. As far as the cities themselves, they each have their own compelling charms. Berlin is quirky, artsy, and interesting. Amsterdam is healthy, gorgeous, and creative. Both cities have a similar cost of living, but it’s the quality of life that expats should consider first when choosing between the two. There’s a huge expat community of creatives in Berlin, which is fantastic for those looking for an easy transition. But most Dutch people speak fluent English, which breaks down the barriers between expats and locals. In the next section we’ll take a closer look at how the cost of living and quality of life compare in these two unique European cities. Expat Scene: The majority of expats in Berlin and Amsterdam are between the ages of 20 to 40, however there are retirees as well as families in both cities. Art and culture play a big role in the everyday life of Berlin, as well as Amsterdam. Both cities have a strong café culture, and good wifi. There is a blogger and digital nomad contingent in Berlin, but you can surely find your way outside of it too. More than digital nomads, you’ll find a range of artists, writers, and creatives in Berlin. Amsterdam is filled with a range of people from all walks of life, but has a small blogger contingent than Berlin. The fact that English is so widely spoken in the Netherlands makes the expat scene only one small portion of the potential friends and community in Amsterdam. Average Local Salary: In Germany the average monthly salary is €2,300 and minimum wage in Berlin at last check was €8.50 per hour. In the Netherlands the average monthly salary is€2,225 with an €8.70 minimum wage. Safety: Like any big city, there can be issues with crime. The latest buzz in Germany centers on the refugee situation and how that is affecting the culture and safety. It’s too polarized to have a firm grasp on the implications, but I highly recommend that interested expats visit both cities to better understand the vibe and way of life. Water: The water is safe to drink in both Berlin and Amsterdam. Visas: Germany and the Netherlands are a part of the Schengen Agreement, which means North Americans (and many other nationalities) can visit both countries without a visa for three months in a six month period. Because of the number of expats in Berlin and around Germany, there is a good deal of information online. In Germany, it is possible to apply for a freelance or artist’s visa (more info here). Before you can apply for a freelance visa, you will need to apply for a residence visa — this is also a requirement for those who wish to retire in Germany. It’s a mass of paperwork, but re-upping once you’re past the first visa is arguably easier. In the Netherlands, it’s far more difficult to secure the freelancer or startup visa and they have stringent policies in place. Possible Issues: For non-Europeans, the hardest part is often securing the visa. You’ll need to jump through hoops like translating documents and securing personal health insurance. You’ll also pay high taxes on income in both countries. Other than that, both cities have vibrant cultures, interesting nuances, and a lot to offer expats, digital nomads, retirees. Child Friendliness: The Netherlands has a very child-friendly culture and a lot of life is lived outdoors. Many families use modified bicycles to navigate the Amsterdam. It’s common to see families at the city’s parks, navigating the farmer’s markets, and generally enjoying life. Berlin winters can be grim, but, like the Netherlands, the city comes alive with outdoor activities in the summer months. Both cities have international schools and local options too. Pet Friendliness: Both Berlin and Amsterdam are pet-friendly cities and it’s easy to navigate the outdoor café culture with dogs in tow. A mecca for students, artists and musicians, Berlin is also favored by entrepreneurs, bloggers, digital nomads, and freelancers. 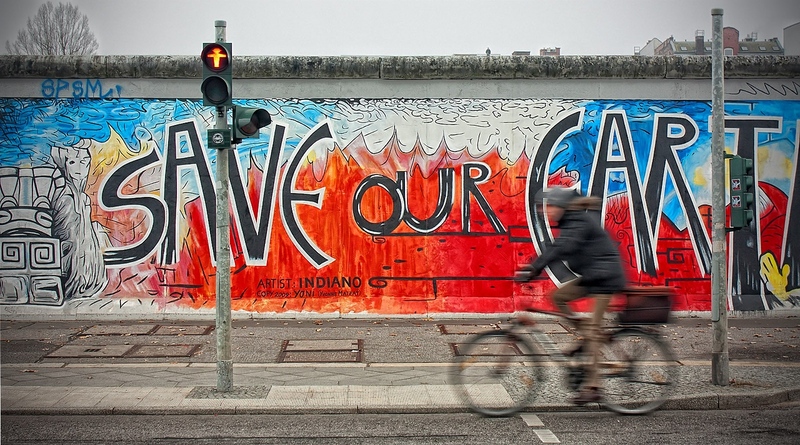 So many choose Berlin thanks, in part, to Germany’s accessible freelance visa. But it’s also for the quirky, irreverent, youthful vibe that bursts with art and culture. A mecca for students, artists and musicians, Berlin is also a highly favorable place for entrepreneurs, digital nomads, and freelancers. All these various expats choose Berlin thanks, in part, to Germany’s freelance visa. The city is overflowing with art and culture and has a young vibe. The café culture is strong and you can easily get around on public transportation. While there are some families and retirees in Berlin, the majority of expats and digital nomads are between the ages of 20 to 40. It’s the artist’s vibe that has so many expats choosing Berlin as their home. If you do a tourist search, you’ll see street art tours for nearly every neighborhood. And the language barrier is also doable. Many Germans within the cities speak a decent amount of English, so in the early months of living there you can get by — but it’s recommended that you learn German if you plan to call Germany your long-term home. German cuisine consists of meats like pork, beef, and chicken, and some fish. Vegetables are traditionally consumed in stews or soups, but are also served as a side dish. Root vegetables and cabbage are the most common. Germany doesn’t have a main national dish, as there are many regions within the country, and each region has its own specialty. Sausages are quite common; there are 1,500 varieties in Germany. Traditional German cuisine may not be vegetarian or vegan friendly, but there are plenty of vegetarian and vegan restaurants to choose from in Berlin — Happy Cow lists more than 300 and is a great resource. If you’re celiac and require gluten-free food options in Berlin, you will not be disappointed. Both Yelp and Foursquare have gluten-free restaurant lists, and there are plenty of shops in Berlin selling gluten-free foods to cook at home. For expats who love street foods and cheap foods, the city has a range of options that come in at and under 5 Euros. It’s possible to eat out, drink, and have a good time on a budget that would be impossible in nearby France or in the U.K.
All cost of living estimates on the right are adjusted to form a best-estimate on the budget for a single person in that city. The case-studies, however, include a range of expats from varying lifestyles and with varying requirements for their quality of life. With these large European cities, the price will come down to the neighborhoods you choose and the type of life you plan to lead. In both cities, you can lower your costs by cooking at home and taking public transport. The life you add above the basics, however, adds up quickly since you are, after all, living in Western Europe. Ali is a 30-something married writer and expat living in Berlin. Ali and her husband lived in Freiburg, Germany for three years before moving to Berlin. Her monthly cost of living came in at $2,594.32 on average per month, which includes an Airbnb apartment rental. This reflects a higher rent than most expats would face when renting long-term. That said, Ali and her husband received a discount of 169 euros for November and December. While they could have rented a proper apartment, the options available were either too expensive or too far from her husband’s work. After rent, the majority of his expenses can be attributed to eating out, followed by transportation and activities. An Australian travel journalist and blogger living in Berlin, Rachel has been living in Berlin with her partner for almost three years. Her cost of living came in at 1,357 Euros on average per month, which includes an apartment in Prenzlauer Berg (a more expensive area in the city), a gym membership, health insurance and public transportation. The post does not include a total of what was spent on food, but she does give an indication of how much the average meal for two would cost when ordering food and drinks. While legacy tenants can pay as little as Euro 300 per month to rent an apartment, the popularity and growth in Berlin means you should anticipate spending upwards of 550 Euros per month for a nice place in a decent area of town. You can spend less if you’re willing to rent just a room in a flat with others. For transport, you’re looking at an U-Bahn monthly pass costing between 58 and 80 Euro/month. This post has a good rundown of cost ranges for everything from internet to healthcare. Amsterdam is a European hotspot for students and entrepreneurs. It’s a laid-back city with friendly locals, good food, and vibrant culture. To blend with the locals, you’ll need to a bike to navigate the city and plan on enjoying the city’s parks and cafes — this is a city that loves to live outdoors when the weather permits. Located quite close to Germany, Amsterdam is another European hotspot for students, entrepreneurs, and digital nomads. Amsterdam, in general, is a very laid back city with friendly locals, good food, and vibrant culture. To blend with the locals, you’ll need to a bike to navigate the city and use public transportation when your legs are not up to cycling. There is a strong cafe culture here too, and it’s a city that loves to live outdoors when the weather permits. This is also a great spot for startups. More than the uber-budget crowd, in Amsterdam you’ll find the coworking spaces filled with entrepreneurs and those on a mid-range budget working on their passion projects. And while there is a young crowd in Amsterdam, it is also perfect for families and retirees. The Dutch have a lovely focus on family, and children are welcomed and loved as a part of everyday life. Unlike Germany, Dutch cuisine is heavy on vegetables and light on meat. Popular traditional food includes Stamppot (mashed potatoes mixed with vegetables like kale, carrots, or sauerkraut), Erwtensoep (thick pea soup), and Poffertjes (delicious tiny pancakes). Amsterdam (and the cities all over the country) offer a range of farmer’s markets with beautiful fruits and vegetables. Being vegetarian or vegan in Amsterdam is quite easy, Happy Cow has a long list of restaurants to choose from, and dining in regular restaurants should not pose a problem as vegetables are an integral part of Dutch cuisine. When I housesat in Amsterdam, I also found the farmer’s markets delightful and enjoyed cooking with the range of beautiful fruit and veg on offer. Amsterdam is an easy city for those with celiac disease as most restaurants and cafes have gluten-free options — and are more than happy to tell you about them! It also must be said that the weather can be lovely, especially in the summers. The temperate maritime climate means that while winter is cold, it’s quite less severe than nearby Germany. You’ll have your snow on the ground, but it’s a tad milder. Both countries, however, are generally categorized as dark and cold throughout December and January. I have adjusted the cost of living estimates on the right to form a best-estimate on the budget for a single person living in Amsterdam with a similar lifestyle to those profiled. Europe is a place of general wealth, however, so there are few rock-bottom options, and with these large European cities, the price comes down to the neighborhoods you choose and the type of life you plan to lead. Ways to think about lowering your costs compared to the estimates include transportation options and food choices, as well as the location of your rental. Niall Doherty is an Irish expat living in Amsterdam. Before settling in Amsterdam, Niall spent 44 months traveling around the world without flying. Niall reports that his cost of living comes in at 2,015 Euros ($2,227 USD) on average each month. I love this post because Niall has included a helpful video on his living costs in Amsterdam and he covers everything from finding an apartment to buying a bike to eating. His monthly expenses include a gym membership, and an apartment in the heart of the city. His food expenses are split between eating out and cooking at home. Niall isn’t penny-pinching and he’s in a great part of the city. With that in mind, it’s definitely possible to live in Amsterdam for less. Romy and Dennis have an interesting perspective on moving to Amsterdam. They are a Dutch couple that previously lived in Eastern Europe and moved back to Amsterdam in late 2015. They’ve chronicled the process and have insight into how the costs stack up now that they’re back on home soil. While they don’t offer a final total, it seems that their living costs as a couple average about Euro 2,500 per month minimum, with €1,394 going toward rent and utilities in the city center. Utilities, food, and other parts of their life then make for a good baseline look at costs for a mid-range budget in Amsterdam. Rent in Amsterdam is higher than Berlin. If you’re keen on staying in the city-center you are looking at an easy Euro 750 for a studio, and it quickly rises from there. Outside of the city center, you can often find cheaper rent, like with anywhere, but you will pay a bit more as a baseline cost in Amsterdam versus Berlin. Getting Out: Your Guide to Leaving America: The author of this book did the move to Berlin and has great insight. There are a lot of these general guides. The book above, Better Life is about where is a good culture fit, whereas this is the better of the lot of “move overseas” books that covers the practicalities and very hands-on information you need as someone considering living anywhere outside the U.S. If you’re new all the researching, this can kick-start your process. And if you are laser-focused on the retirement topic, versus moving overseas at a different state in life, this retirement guide has great advice. Moving to Germany: Top 10 Things to consider: A helpful post covering everything from getting oriented in the city to visas to finding an apartment to shipping your belongings to Germany. The Neighborhoods of Berlin: A thorough breakdown of the neighborhoods so you can begin to consider in which part you would want to begin your apartment/home search. Planning to retire to Germany? This guide talks about the income, health insurance and inheritance tax. The German Retirement and Pension System: An extremely useful post for those wishing to retire in Germany; including information on the public retirement insurance system and individual retirement investments. How to Germany: Probably one of the most useful resource websites for those who wish to relocate to Germany. Worth bookmarking and referring to when you have a question prior to your move. Includes information on bringing your pet to Germany! Berlin: The Ultimate Resource Guide: Dan and Audrey Scott have called Berlin home for several years, and they have written an incredibly useful guide to the city. A must read if you wish to live in Berlin! Check out these FB groups and expat forums: Berlin Expats, Expatriates in Berlin, Berlin Freelancers. Finding the right visa: This residence wizard section of the Netherlands Immigration and Naturalisation Service gives all the residence/visa information you need; covering everything from being an Au pair in the Netherlands to being a start-up and more. The New Dutchies has an updated series of posts leading through the process of moving to Amsterdam. Bringing your pets to Amsterdam? This post on I Am Amsterdam details everything you need to know before you arrive, including documentation and vaccines. I Am Expat is a wonderfully useful website for those wishing to move to Amsterdam, or elsewhere in the Netherlands; includes information on health insurance, renting an apartment, entertainment, finding work, and more. Check out these FB groups and expat forums: Digital Nomads Amsterdam, Expats in Amsterdam, or Creative Freelancers Amsterdam. Planning a Research Trip to Germany or the Netherlands? Pick out a good travel insurance policy like World Nomads (I’ve used them since 2008) to cover you while you’re either in transit visiting your future homes, or their insurance policies can work well as long-term expat insurance too. You’ll also want property insurance once you’re living overseas — I’ve used Clements for many years now. If you’re visiting Berlin, I recommend Pfefferbett Hostel Berlin as a super budget option, or Leonardo Royal Hotel Berlin Alexanderplatz for mid-range prices and accessibility to the places you’ll likely need to research. If you’re visiting Amsterdam, I recommend Dutchies Hostel as a super budget option, or ClinkNOORD Hostel for mid-range prices and accessibility to the places you’ll likely need to research. Airbnb is grow popular throughout the cities, so it’s a good way to see how you can live like a local by renting from a local.